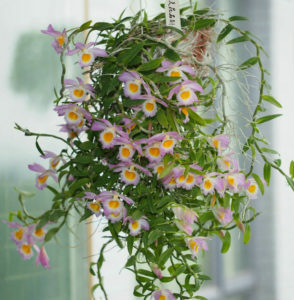 Dendrobium loddigesii Rolfe Stems weak, often drooping, thinly cylindrical, 10-45 cm long, ca. 3 mm, sometimes branched, with multiple nodes; internodes 1.5-2 cm long, golden brown. Leaves papery, two rows, alternating throughout stem, tongue-shaped, oblong-lanceolate or slightly obliquely oblong, usually 2-4 cm long, 1-1.3 cm wide, apex acute and slightly hooked, base With sheath, dry on the surface of the veins uplift was grid-like; leaf sheath membranous, dry often after the opening of the sheath. Flowers white or purple, each side of the bundle of 1-2 born in the upper stem of the old leaves; inflorescences 2-3 mm long, base is 1-2 short, cuplike membranous sheath; bracts membranous, Ovate, ca. 2 mm, apex obtuse; pedicel and ovary pale green, 2-3 cm long; middle sepals ovate-oblong, ca. 1.7-2 cm, ca. 7 mm, apex acute, with 5 veins ; Sepals lanceolate, ca. 1.7-2 cm, 6-7 mm wide, apex acute, base askew, with 5 veins; calyx sac nearly spherical, ca. 5 mm. Petals elliptic, as long as middle sepals, 8-9 mm wide, apex obtuse, margin entire, with 3-5 veins; lip nearly circular, 1.7-2 cm in diam . ; upper central golden yellow, peripheral purple Red, slightly concave, margin short fringed, both sides densely covered pubescent; limb white, with red stripes on both sides, ca. 4 mm; cap white, nearly conical, With irregular teeth. Flowering from April to May. Dendrobium flower was born in 400-1500 meters above sea level in the mountain forest trunks or understory rocks. Production in Guangxi, China (Napo, meltwater, Lingyun, Longzhou, Yongfu, Eastland, Jingxi, Longlin and other places), southern Guangdong (Luofu), Hainan (Baisha), southwestern Guizhou , Guanling), southern Yunnan (Simao, Mengla). Distributed in Laos, Vietnam. Specimens collected from Guangdong (Luo Fu Shan). Is a kind of hi-perennial herbaceous hippocampus, like in the warm, humid, annual rainfall of more than 1000 mm, half-shade half-sun environment, the average January temperature above 8 ℃ in the subtropical forests grow better, suitable for growth Temperature of 15 to 28 degrees, suitable for growing air humidity of 60% or more, less demanding on the soil fertility, the wild more in the loose and thick bark or trunk growth, and some also grow in the crevice. Is an aerial root, the main requirements of the root permeability is good, the best substrate to breathe air ventilation, in the appropriate temperature and humidity, fast growth, survivability is very strong. Spring and early summer each year, biennial stems on the section of the inflorescence, flowering stems grow into new stems into stems, autumn and winter into the dormant period. Stems weak, often drooping, thinly cylindrical, 10-45 cm long, ca. 3 mm, sometimes branched, with multiple nodes; internodes 1.5-2 cm long, golden brown. 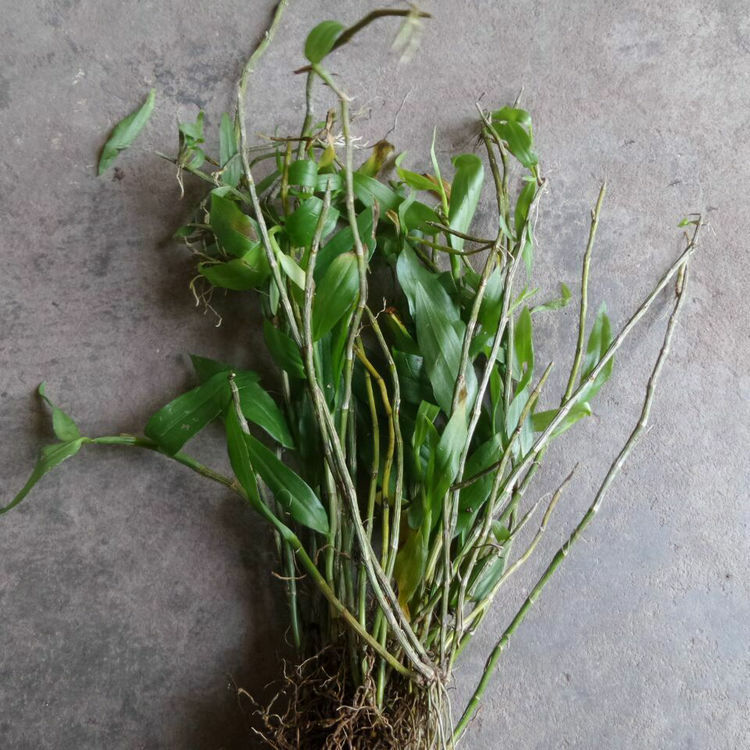 Leaves papery, two rows, alternating throughout stem, tongue-shaped, oblong-lanceolate or slightly obliquely oblong, usually 2-4 cm long, 1-1.3 cm wide, apex acute and slightly hooked, base With sheath, dry on the surface of the veins uplift was grid-like; leaf sheath membranous, dry often after the opening of the sheath. Dendrobium loddigesii Rolfe was born in 400-1500 meters above sea level in the mountain forest trunks or understory rocks. Production in Guangxi, China (Napo, meltwater, Lingyun, Longzhou, Yongfu, Eastland, Jingxi, Longlin and other places), southern Guangdong (Luofu), Hainan (Baisha), southwestern Guizhou , Guanling), southern Yunnan (Simao, Mengla). Distributed in Laos, Vietnam. Specimens collected from Guangdong (Luo Fu Shan). Is a kind of hi-perennial herbaceous hippocampus, like in the warm, humid, annual rainfall of more than 1000 mm, half-shade half-sun environment, the average January temperature above 8 ℃ in the subtropical forests grow better, suitable for growth Temperature of 15 to 28 degrees, suitable for growing air humidity of 60% or more, less demanding on the soil fertility, the wild more in the loose and thick bark or trunk growth, and some also grow in the crevice. Is an aerial root, the main requirements of the root permeability is good, the best substrate to breathe air ventilation, in the appropriate temperature and humidity, fast growth, survivability is very strong. Spring and early summer each year, biennial stems on the section of the inflorescence, flowering stems grow into new stems into stems, autumn and winter into the dormant period.